Today within neoliberal democracies, gender and sexuality provisions give people the opportunity of being granted social and legal protection. But how does the asylum system intervene within claimants’ understandings of themselves and in what ways does this affect their livelihoods in the country of arrival? The Sexual Politics of Asylum emerges from a 2 year long ethnography, which explores the experiences of 60 gender and sexual minority refugees in the UK. Bringing previously unheard stories to the forefront, this enlightening volume challenges dominant notions about the construction of sexuality and gender as an instrument for claiming rights in a world shaped by postcolonial relations. Giametta first examines why the migratory experience of the studied migrants is located within a set of humanitarian-inflected discourses that privilege suffering and trauma. This is then followed by an assessment of the respondents’ biographical accounts, which consequently uncovers how being situated in liminal socio-political and legal interstices produces precarious forms of life. Whilst the topic of asylum for gender and sexual minorities has attracted wide media coverage over the past decade, there persists a lack of academic attention to the complex experiences of these refugees. As such, this timely book will be of interest to undergraduate and postgraduate students interested in human rights, sociology, anthropology, migration, sexuality, gender and cultural studies, as well as people working within the refugee granting process. 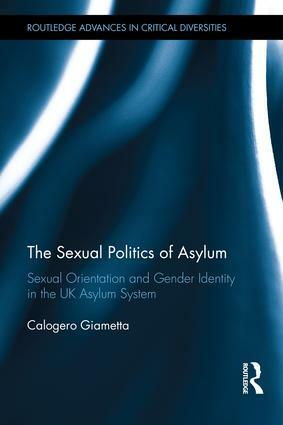 In this impressive ethnographic study, Calogero Giametta illuminates the lived experiences of subalternised gender and sexual ‘others,’ bringing nuance and grounded complex theoretical insights into contemporary debates on homophobia, homonationalism, humanitarianism and the politics of sexual and gender justice on a transnational scale. Through a thorough analysis comprising a number of discourses and sites -from the legal procedures involved in the process of asylum claims to the embodied practices of asylum claimants-, the book reveals the impact of neoliberal politics on the sexual and gendered regulation of borders and rights, but also the intricacies of agency in situations of hardship. A powerful and elegant intervention that invites us to reconsider the relationship between geopolitics, culture, identity and sexual politics today. Giametta demonstrates how the capacity for asylum claims on the basis of sexuality and gender identity is based on very rigid understandings of these categories that seldom correspond to the complexity of the lived experiences of LGBT migrants. He argues that there are limits to strict identity politics in postcolonial times, especially when those identity categories become implicated in securing the borders of the nation-state…Where I think The Sexual Politics of Asylum makes a far more profound and original contribution is through its recognition that the humanitarian logics of contemporary sexual politics serve to silence the subjectivities of the very subjects it seeks to "rescue", thus perpetuating their subaltern status and refusing to "listen to the contradictions, inconsistencies, and tensions" (p151) within their narratives. This reinforces a "structural ignorance" about the lives of those who cannot or will not make their lives intelligible in relation to dominant European identity politics. Introduction. Gender and Sexual Minority Migrants and the Asylum Process in the UK. Traces of Difference: Self-Awareness, Distress and Coping Strategies. The Global Politics of LGBT Rights. Sexuality/Gender and the Legal Process of Asylum. The Making of Knowable and Liberated Subjectivities in the Context of Asylum. The Materality of Asylum: The Production of Illegality, Poverty and the Home Office Procedures. Calogero Giametta is a sociologist and post-doctoral research fellow at the Laboratoire Méditerranéen de Sociologie of Aix-Marseille Université.